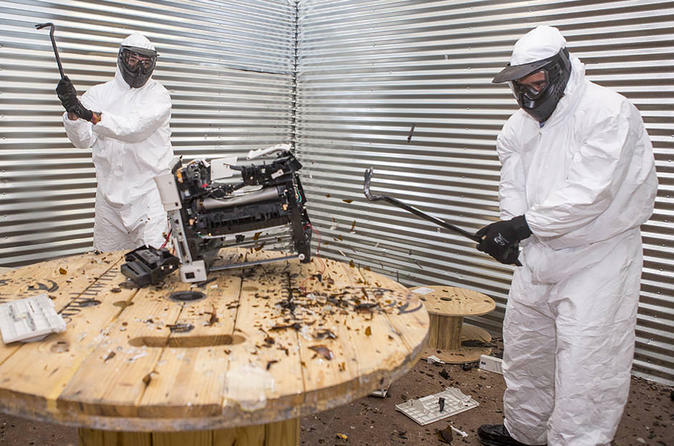 Wreck Room is a destruction experience where you will be able to destroy everyday items in a safe and clean up free area. First, you will be outfitted in a full suit of safety gear over your street clothes. Then you get to choose your weapon, bats and crowbars are standard and seem to get the job done pretty well. Once you are suited and armed we drop you off in a camera monitored room where you will be able to destroy everything in sight! Once you are finished you hop out of your safety gear and we take care of the mess. Have you ever wanted to break something for no reason? Of course you have, you are human right? At Wreck Room you're allowed to touch on those primal expressions of rage you don’t get to experience in your everyday life. Just a mile from the Strip your destruction experience is right around the corner. Packages are available for up to five guests. Before the wrecking, you will be suited up in a full set of safety gear, getting covered from head to toe. Breakables include anything from bottles and ceramics to TVs and computer printers.Bats and crowbars are supplied, just bring the pent up anger. Once you get suited up, you'll be escorted to a camera monitored wreck room where you'll get to demolish everything in sight. You will enjoy the exhilarating and satisfying experience of letting loose and destroying all the items into tiny pieces. When you are finished and the adrenaline stops pumping you slip out of your safety gear and leave the clean up to someone else!